What Were The Circumstances Of Jesus' Arrest? Home Jesus The True Easter Story What Were The Circumstances Of Jesus' Arrest? This story of the details of Jesus' betrayal by Judas and his arrest by the Roman soldiers is rich with detail found nowhere else on the planet today. Most of the events are well-known through Biblical stories, but the details of Jesus' mind-set and the truths of his submission to the Father's will-and what that will really meant-are truly revelational materials, and will forever place these matters on a far different plane than the ideas that we have previously entertained. Judas' betrayal, John Mark's narrow escape from arrest, the apostles' call to arms, and the allowing of John Zebedee to accmpany Jesus to Annas as he was led away, while familiar to all of us, are here fleshed out and given new life, as Jesus' Passion is begun. 183:0.3 Failing to disperse his followers, the Master left them and walked down toward the olive press near the entrance to Gethsemane Park. Although the three apostles, the Greeks, and the other members of the camp hesitated immediately to follow him, John Mark hastened around through the olive trees and secreted himself in a small shed near the olive press. Jesus withdrew from the camp and from his friends in order that his apprehenders, when they arrived, might arrest him without disturbing his apostles. The Master feared to have his apostles awake and present at the time of his arrest lest the spectacle of Judas's betraying him should so arouse their animosity that they would offer resistance to the soldiers and would be taken into custody with him. He feared that, if they should be arrested with him, they might also perish with him. 183:1.1 There is great danger of misunderstanding the meaning of numerous sayings and many events associated with the termination of the Master's career in the flesh. The cruel treatment of Jesus by the ignorant servants and the calloused soldiers, the unfair conduct of his trials, and the unfeeling attitude of the professed religious leaders, must not be confused with the fact that Jesus, in patiently submitting to all this suffering and humiliation, was truly doing the will of the Father in Paradise. It was, indeed and in truth, the will of the Father that his Son should drink to the full the cup of mortal experience, from birth to death, but the Father in heaven had nothing whatever to do with instigating the barbarous behavior of those supposedly civilized human beings who so brutally tortured the Master and so horribly heaped successive indignities upon his nonresisting person. These inhuman and shocking experiences which Jesus was called upon to endure in the final hours of his mortal life were not in any sense a part of the divine will of the Father, which his human nature had so triumphantly pledged to carry out at the time of the final surrender of man to God as signified in the threefold prayer which he indited in the garden while his weary apostles slept the sleep of physical exhaustion. 183:2.3 When they failed to find Jesus in the upper chamber, Judas asked the captain of the guard to return to the temple. By this time the rulers had begun to assemble at the high priest's home preparatory to receiving Jesus, seeing that their bargain with the traitor called for Jesus' arrest by midnight of that day. Judas explained to his associates that they had missed Jesus at the Mark home, and that it would be necessary to go to Gethsemane to arrest him. The betrayer then went on to state that more than threescore devoted followers were encamped with him, and that they were all well armed. The rulers of the Jews reminded Judas that Jesus had always preached nonresistance, but Judas replied that they could not depend upon all Jesus' followers obeying such teaching. He really feared for himself and therefore made bold to ask for a company of forty armed soldiers. Since the Jewish authorities had no such force of armed men under their jurisdiction, they went at once to the fortress of Antonia and requested the Roman commander to give them this guard; but when he learned that they intended to arrest Jesus, he promptly refused to accede to their request and referred them to his superior officer. In this way more than an hour was consumed in going from one authority to another until they finally were compelled to go to Pilate himself in order to obtain permission to employ the armed Roman guards. It was late when they arrived at Pilate's house, and he had retired to his private chambers with his wife. He hesitated to have anything to do with the enterprise, all the more so since his wife had asked him not to grant the request. But inasmuch as the presiding officer of the Jewish Sanhedrin was present and making personal request for this assistance, the governor thought it wise to grant the petition, thinking he could later on right any wrong they might be disposed to commit. 183:2.4 Accordingly, when Judas Iscariot started out from the temple, about half after eleven o'clock, he was accompanied by more than sixty persons—temple guards, Roman soldiers, and curious servants of the chief priests and rulers. 183:3.1 As this company of armed soldiers and guards, carrying torches and lanterns, approached the garden, Judas stepped well out in front of the band that he might be ready quickly to identify Jesus so that the apprehenders could easily lay hands on him before his associates could rally to his defense. And there was yet another reason why Judas chose to be ahead of the Master's enemies: He thought it would appear that he had arrived on the scene ahead of the soldiers so that the apostles and others gathered about Jesus might not directly connect him with the armed guards following so closely upon his heels. Judas had even thought to pose as having hastened out to warn them of the coming of the apprehenders, but this plan was thwarted by Jesus' blighting greeting of the betrayer. Though the Master spoke to Judas kindly, he greeted him as a traitor. 183:3.4 Jesus made one last effort to save Judas from actually betraying him in that, before the traitor could reach him, he stepped to one side and, addressing the foremost soldier on the left, the captain of the Romans, said, "Whom do you seek?" The captain answered, "Jesus of Nazareth." Then Jesus stepped up immediately in front of the officer and, standing there in the calm majesty of the God of all this creation, said, "I am he." Many of this armed band had heard Jesus teach in the temple, others had learned about his mighty works, and when they heard him thus boldly announce his identity, those in the front ranks fell suddenly backward. They were overcome with surprise at his calm and majestic announcement of identity. There was, therefore, no need for Judas to go on with his plan of betrayal. The Master had boldly revealed himself to his enemies, and they could have taken him without Judas's assistance. But the traitor had to do something to account for his presence with this armed band, and besides, he wanted to make a show of carrying out his part of the betrayal bargain with the rulers of the Jews in order to be eligible for the great reward and honors which he believed would be heaped upon him in compensation for his promise to deliver Jesus into their hands. 183:3.5 As the guards rallied from their first faltering at the sight of Jesus and at the sound of his unusual voice, and as the apostles and disciples drew nearer, Judas stepped up to Jesus and, placing a kiss upon his brow, said, "Hail, Master and Teacher." And as Judas thus embraced his Master, Jesus said, "Friend, is it not enough to do this! Would you even betray the Son of Man with a kiss?" 183:3.6 The apostles and disciples were literally stunned by what they saw. For a moment no one moved. Then Jesus, disengaging himself from the traitorous embrace of Judas, stepped up to the guards and soldiers and again asked, "Whom do you seek?" And again the captain said, "Jesus of Nazareth." And again answered Jesus: "I have told you that I am he. If, therefore, you seek me, let these others go their way. I am ready to go with you." 183:3.7 Jesus was ready to go back to Jerusalem with the guards, and the captain of the soldiers was altogether willing to allow the three apostles and their associates to go their way in peace. But before they were able to get started, as Jesus stood there awaiting the captain's orders, one Malchus, the Syrian bodyguard of the high priest, stepped up to Jesus and made ready to bind his hands behind his back, although the Roman captain had not directed that Jesus should be thus bound. When Peter and his associates saw their Master being subjected to this indignity, they were no longer able to restrain themselves. Peter drew his sword and with the others rushed forward to smite Malchus. But before the soldiers could come to the defense of the high priest's servant, Jesus raised a forbidding hand to Peter and, speaking sternly, said: "Peter, put up your sword. They who take the sword shall perish by the sword. Do you not understand that it is the Father's will that I drink this cup? And do you not further know that I could even now command more than twelve legions of angels and their associates, who would deliver me from the hands of these few men?" 183:3.8 While Jesus thus effectively put a stop to this show of physical resistance by his followers, it was enough to arouse the fear of the captain of the guards, who now, with the help of his soldiers, laid heavy hands on Jesus and quickly bound him. And as they tied his hands with heavy cords, Jesus said to them: "Why do you come out against me with swords and with staves as if to seize a robber? I was daily with you in the temple, publicly teaching the people, and you made no effort to take me." 183:3.9 When Jesus had been bound, the captain, fearing that the followers of the Master might attempt to rescue him, gave orders that they be seized; but the soldiers were not quick enough since, having overheard the captain's orders to arrest them, Jesus' followers fled in haste back into the ravine. All this time John Mark had remained secluded in the near-by shed. 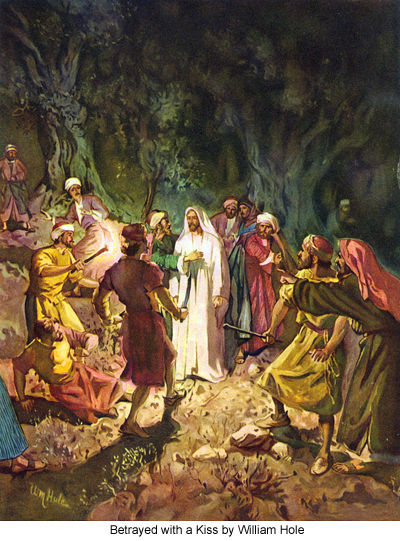 When the guards started back to Jerusalem with Jesus, John Mark attempted to steal out of the shed in order to catch up with the fleeing apostles and disciples; but just as he emerged, one of the last of the returning soldiers who had pursued the fleeing disciples was passing near and, seeing this young man in his linen coat, gave chase, almost overtaking him. In fact, the soldier got near enough to John to lay hold upon his coat, but the young man freed himself from the garment, escaping naked while the soldier held the empty coat. John Mark made his way in all haste to David Zebedee on the upper trail. When he had told David what had happened, they both hastened back to the tents of the sleeping apostles and informed all eight of the Master's betrayal and arrest. 183:3.10 At about the time the eight apostles were being awakened, those who had fled up the ravine were returning, and they all gathered together near the olive press to debate what should be done. In the meantime, Simon Peter and John Zebedee, who had hidden among the olive trees, had already gone on after the mob of soldiers, guards, and servants, who were now leading Jesus back to Jerusalem as they would have led a desperate criminal. John followed close behind the mob, but Peter followed afar off. After John Mark's escape from the clutch of the soldier, he provided himself with a cloak which he found in the tent of Simon Peter and John Zebedee. He suspected the guards were going to take Jesus to the home of Annas, the high priest emeritus; so he skirted around through the olive orchards and was there ahead of the mob, hiding near the entrance to the gate of the high priest's palace. 183:4.1 James Zebedee found himself separated from Simon Peter and his brother John, and so he now joined the other apostles and their fellow campers at the olive press to deliberate on what should be done in view of the Master's arrest. 183:4.2 Andrew had been released from all responsibility in the group management of his fellow apostles; accordingly, in this greatest of all crises in their lives, he was silent. After a short informal discussion, Simon Zelotes stood up on the stone wall of the olive press and, making an impassioned plea for loyalty to the Master and the cause of the kingdom, exhorted his fellow apostles and the other disciples to hasten on after the mob and effect the rescue of Jesus. The majority of the company would have been disposed to follow his aggressive leadership had it not been for the advice of Nathaniel, who stood up the moment Simon had finished speaking and called their attention to Jesus' oft-repeated teachings regarding nonresistance. He further reminded them that Jesus had that very night instructed them that they should preserve their lives for the time when they should go forth into the world proclaiming the good news of the gospel of the heavenly kingdom. And Nathaniel was encouraged in this stand by James Zebedee, who now told how Peter and others drew their swords to defend the Master against arrest, and that Jesus bade Simon Peter and his fellow swordsmen sheathe their blades. Matthew and Philip also made speeches, but nothing definite came of this discussion until Thomas, calling their attention to the fact that Jesus had counseled Lazarus against exposing himself to death, pointed out that they could do nothing to save their Master inasmuch as he refused to allow his friends to defend him, and since he persisted in refraining from the use of his divine powers to frustrate his human enemies. Thomas persuaded them to scatter, every man for himself, with the understanding that David Zebedee would remain at the camp to maintain a clearinghouse and messenger headquarters for the group. By half past two o'clock that morning the camp was deserted; only David remained on hand with three or four messengers, the others having been dispatched to secure information as to where Jesus had been taken, and what was going to be done with him. 183:4.3 Five of the apostles, Nathaniel, Matthew, Philip, and the twins, went into hiding at Bethphage and Bethany. Thomas, Andrew, James, and Simon Zelotes were hiding in the city. Simon Peter and John Zebedee followed along to the home of Annas. 183:4.4 Shortly after daybreak, Simon Peter wandered back to the Gethsemane camp, a dejected picture of deep despair. David sent him in the charge of a messenger to join his brother, Andrew, who was at the home of Nicodemus in Jerusalem. 183:4.5 Until the very end of the crucifixion, John Zebedee remained, as Jesus had directed him, always near at hand, and it was he who supplied David's messengers with information from hour to hour which they carried to David at the garden camp, and which was then relayed to the hiding apostles and to Jesus' family. 183:4.6 Surely, the shepherd is smitten and the sheep are scattered! While they all vaguely realize that Jesus has forewarned them of this very situation, they are too severely shocked by the Master's sudden disappearance to be able to use their minds normally. 183:4.7 It was shortly after daylight and just after Peter had been sent to join his brother, that Jude, Jesus' brother in the flesh, arrived in the camp, almost breathless and in advance of the rest of Jesus' family, only to learn that the Master had already been placed under arrest; and he hastened back down the Jericho road to carry this information to his mother and to his brothers and sisters. David Zebedee sent word to Jesus' family, by Jude, to forgather at the house of Martha and Mary in Bethany and there await news which his messengers would regularly bring them. 183:5.3 About this time John Zebedee, remembering his Master's instructions to remain always near at hand, hurried up near Jesus as he marched along between the two captains. The commander of the temple guards, seeing John come up alongside, said to his assistant: "Take this man and bind him. He is one of this fellow's followers." But when the Roman captain heard this and, looking around, saw John, he gave orders that the apostle should come over by him, and that no man should molest him. Then the Roman captain said to the Jewish captain: "This man is neither a traitor nor a coward. I saw him in the garden, and he did not draw a sword to resist us. He has the courage to come forward to be with his Master, and no man shall lay hands on him. The Roman law allows that any prisoner may have at least one friend to stand with him before the judgment bar, and this man shall not be prevented from standing by the side of his Master, the prisoner." And when Judas heard this, he was so ashamed and humiliated that he dropped back behind the marchers, coming up to the palace of Annas alone. 183:5.4 And this explains why John Zebedee was permitted to remain near Jesus all the way through his trying experiences this night and the next day. The Jews feared to say aught to John or to molest him in any way because he had something of the status of a Roman counselor designated to act as observer of the transactions of the Jewish ecclesiastical court. John's position of privilege was made all the more secure when, in turning Jesus over to the captain of the temple guards at the gate of Annas's palace, the Roman, addressing his assistant, said: "Go along with this prisoner and see that these Jews do not kill him without Pilate's consent. Watch that they do not assassinate him, and see that his friend, the Galilean, is permitted to stand by and observe all that goes on." And thus was John able to be near Jesus right on up to the time of his death on the cross, though the other ten apostles were compelled to remain in hiding. John was acting under Roman protection, and the Jews dared not molest him until after the Master's death.